In April 2017, a number of Ghanaians and Nigerians got excited after American rap artist Sean John Combs, also known as Diddy posted a video commercial for his Ciroc DeLeon Tequila brand on Instagram. The excitement did not come from the mere posting of the video (since none really cared) but the song (used in the video) Skintight which is originally sang by Nigerian-born Ghanaian based Best International Act, Africa nominee at the BET Awards 2017, Mr. Eazi. For many, the use of his song for a brand that sought to serve an European target was an indication of how far Mr. Eazi's songs had gone. For others, it meant Mr. Eazi would be smiling to the bank but how much exactly would he make out of that and was he or his team even contacted in the first place? Well, Mr. Eazi would not disclose how much he made from that but states the American rap artist and millionaire Diddy didn't have to meet him or his management before using his song. "P. Diddy didn't have to see me or call my management for anything. Out there and just like other well established jurisdictions, there are royalty collection societies (which I join) which are responsible for such stuff so all they do is collect such monies on my behalf. That means the money hits my account without even having to meet anyone who uses my music." 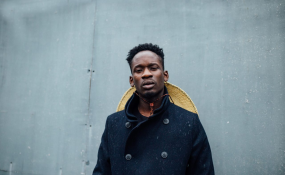 Mr. Eazi, since busting onto the music charts released a 14 track mixtape, Life Is Eazi and has since embarked on a world tour playing shows around Africa and Europe. According to him, his greatest wish is to perform to a packed stadium full of people from different nationalities. "I want to do like a stadium show in like Singapore or in China full of Asians. For me, that will be the biggest award or biggest deal; to have fans from all nationalities in a very big venue all coming to watch Mr. Eazi"